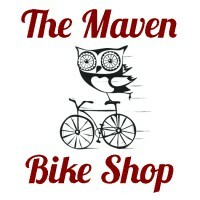 Definitely one of the gnarliest climbs, if not the gnarliest climb in the whole Eastern Sierra. 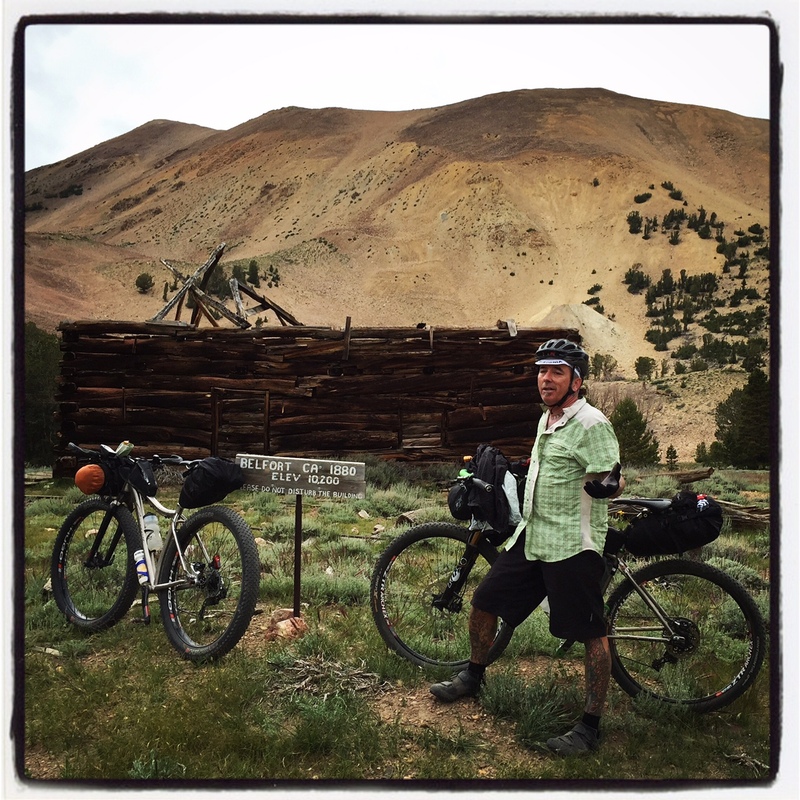 Definitely some of the most amazing views if not the most amazing views and landscapes available to bicycles in the Eastern Sierra. Yeah, I’m stoked here. Little did I know this was a false summit and I still had more climbing!! These seem like tall statements, considering this region is littered with grit testing/visually rewarding climbs like the White Mountain Epic, Coyote Traverse, Laurel Lakes, etc. But I crap you not, this is up there on the podium with them. Once you start the “main climb” up to Mt. 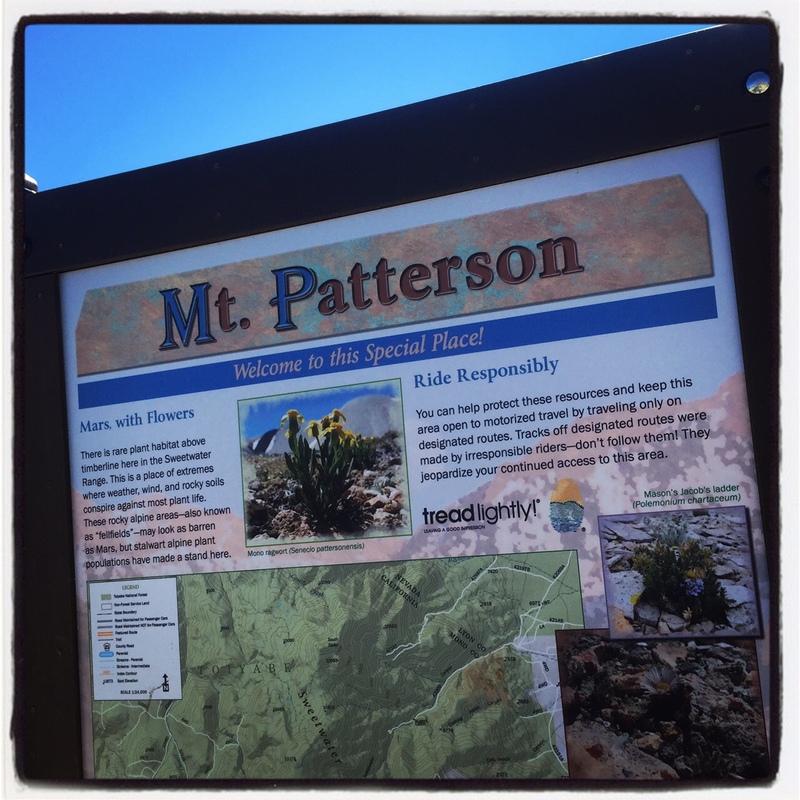 Patterson, it’s about 10 miles with 4,500′ of climbing and one super annoying false summit that stabs you in the gut. Sure, there are plenty of other routes that appear tougher on paper (Silver Canyon with 6k climbing over 9 miles comes to mind). But this dirt is soft and littered with baby heads in sections, making for very tough work, even on the flattest portions. The pitch gets so frickin steep in parts and the extended hike-a-bikes sap your energy and induce hallucination. 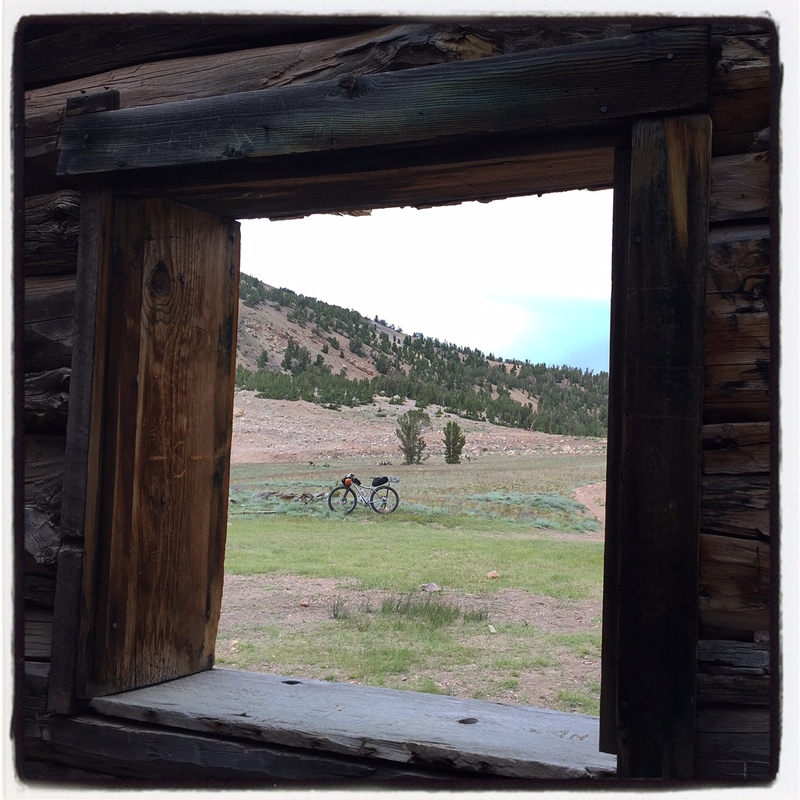 With a loaded bike, and being in the moment, this definitely felt like the hardest HAB I’ve ever done. Luckily for us, we got some trail angel love from a couple of rock crawlers coming down off the 4×4 route. They gave us some cold water and warnings about the storm we were riding into. 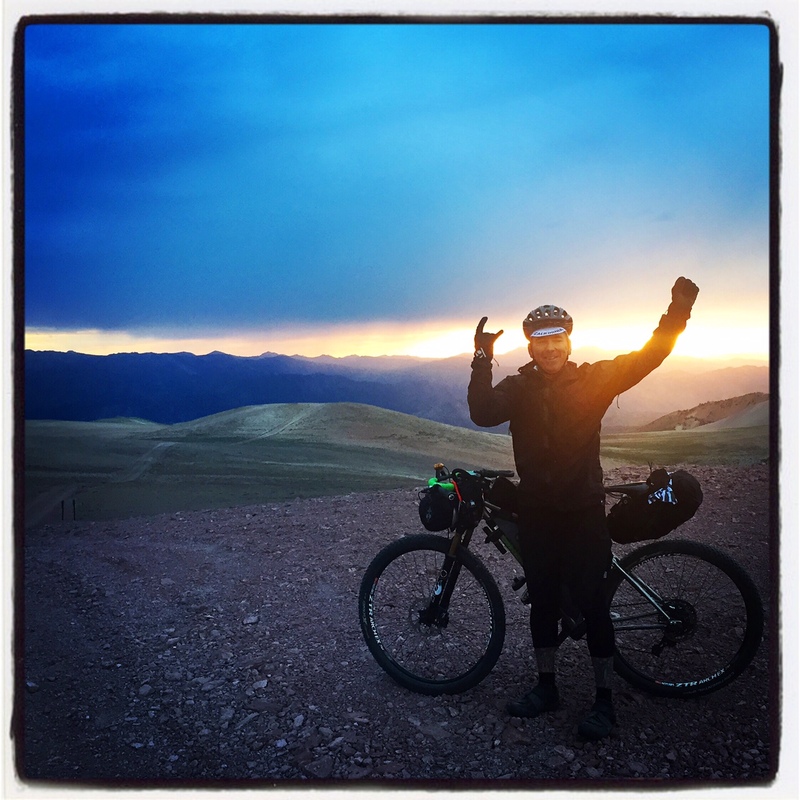 Luckily, we were ready for storms, as we were fully loaded with our bikepacking rigs, and intended to bivy anyway – but the storm never produced more than a drizzle for us. Lots of this going on. Push, push, give. 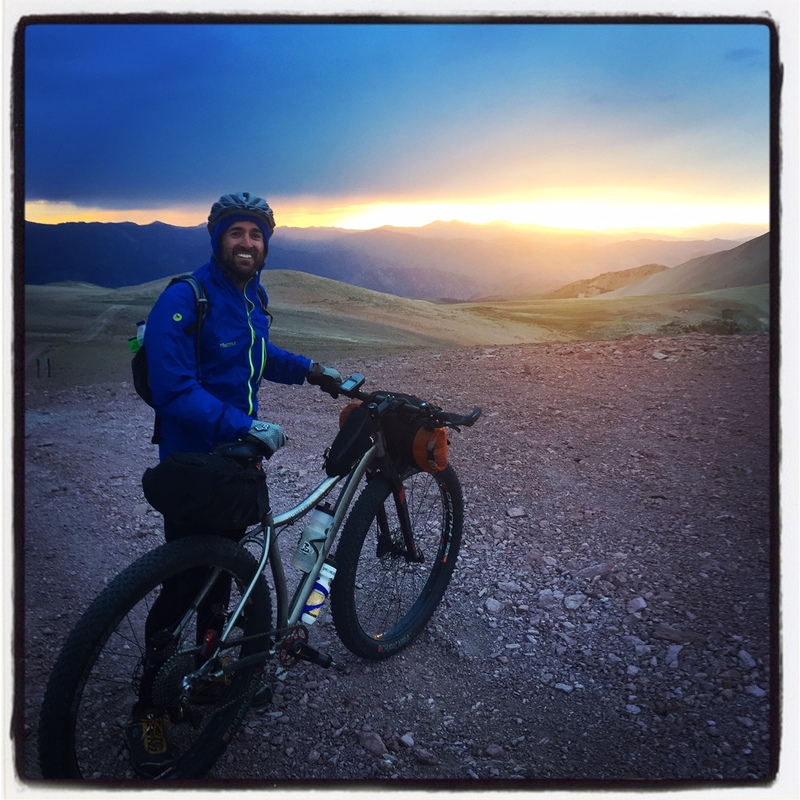 Backstory – Kevin and I were doing some scout riding for the Caldera 500 Route, and wound up starting the ride up the Sweetwaters later in the day than we would’ve liked. But it afforded us cooler temps, and a gorgeous sunset descent to the west. 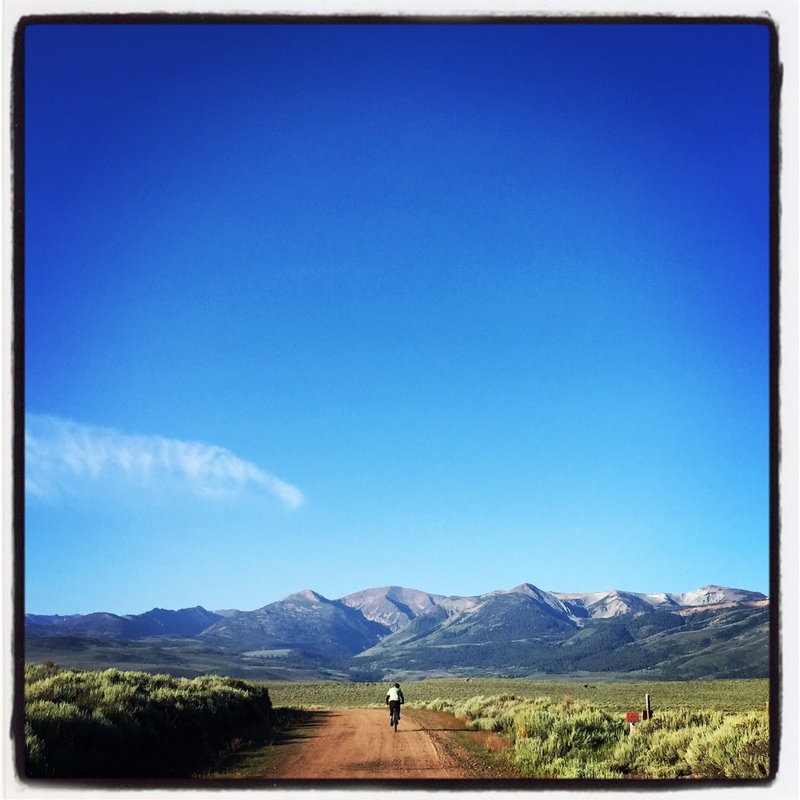 After a stare down with a wild-eyed bull, who even charged at us for 50 yards, we began the traverse east to west, (following the Caldera 500 route). Although most ride it west to east, I have to say, I think east to west is better – the climbing is relentless, regardless, but the descent down Desert Creek with the views out to the Sierra and Yosemite to the west/south are FANTASTIC!! Meanwhile, the climb up the old stage road would make for a much more “meh” descent, and it’s nice to reach the ruins of Belfort mining town (10,200′) for a breather before the last push up to the top. Belfort makes a great pit stop, and is meaningful psychologically as you rest up for your last big push to the summit. Finally made it to Belfort. Two buildings left standing. But we still had lots of climbing to go. People scribed up some window trim in an old Belfort ruins. These dated back to 1953. Super cool. This is one of the few rides I know of (other than the top of White Mountain ), where you can ride your bike right up to the summit/high point of the whole ride. You can pedal straight to the top of Mt. Patterson at 11,644′. Pretty special. They call it “Mars with Flowers” up there. The extreme weather and soil doesn’t allow for much life, but a few rugged flowers and plants have managed to survive. The bald and pale color landscape above timberline is so varied and diverse, it’s breathtaking. When we got up there, the sun was setting and we wanted to descend in ambient light, so I didn’t take as many pics as I’d have liked – but it is marvelous. The last light in the sky was pushing us down that ridge and into the canyon below until we finally needed to put on the lights. The images from that night were pressed into my memory bank with an indelible stamp. 11,500′ false summit. 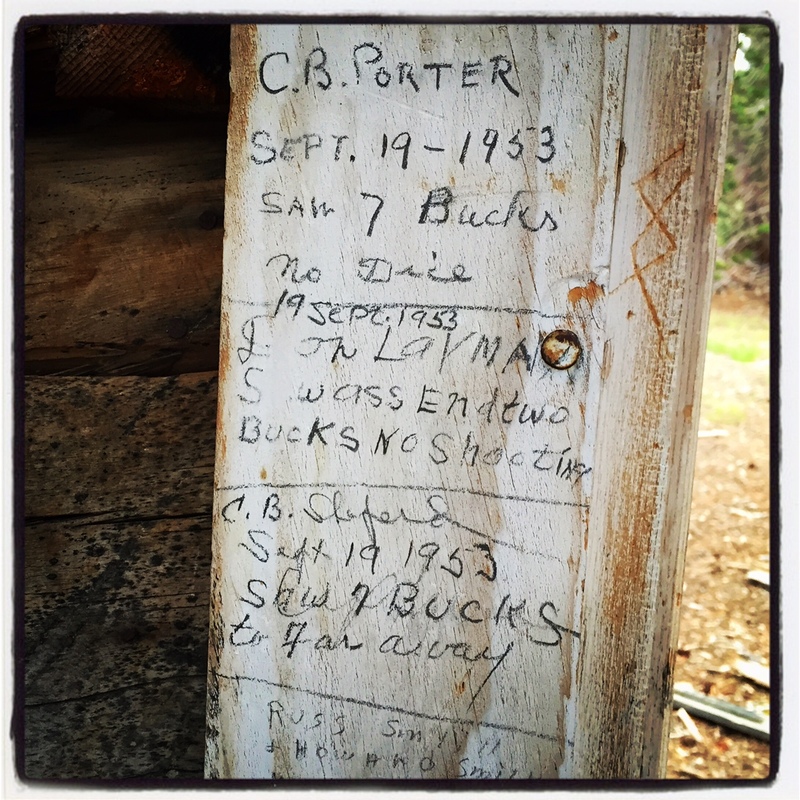 We had to drop back to 11 and then climb right back to 11,600′ – OUCH! We made it down just after nightfall, and camped near Lobdell Lake. Kevin threw me a tangerine, which I somehow lost in my sleeping bag. I didn’t find it until I got up to pee a few hours later and there it was. I stared at the star-filled sky while eating that sweet orange before dozing off again. Good times. When I woke up hungry just after sunrise, I saw Kevin with a small fire going trying to thaw out his damp, creek-drenched socks. I decided to eat the cream-filled churro I’d been saving. Yahoo. 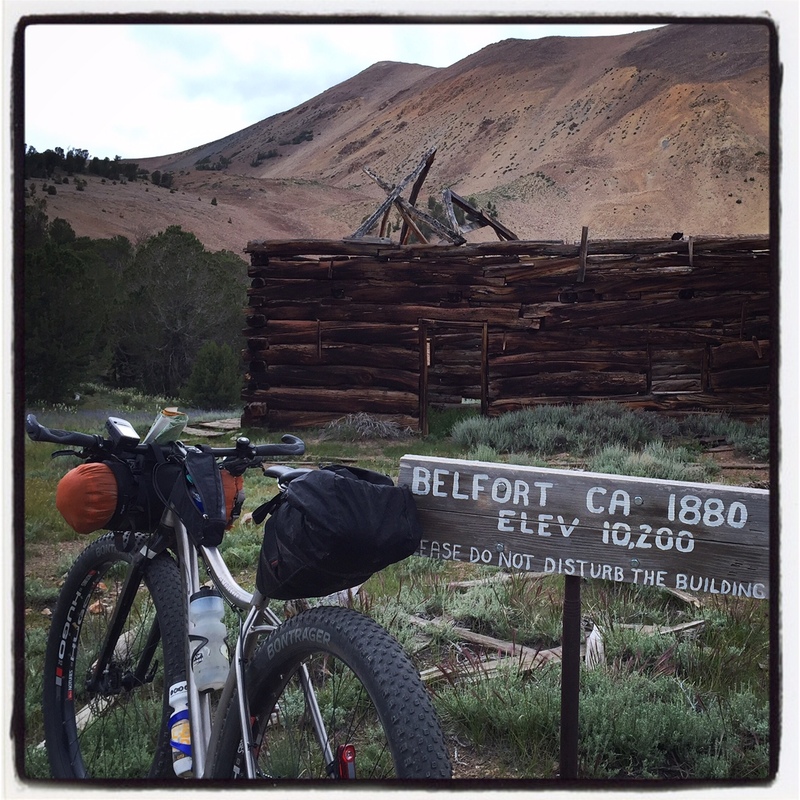 We descended Burcham Flats and cruised back into Bridgeport to finish our loop. Man, was that fun. It was all a dream. Flying down through Bircham Flats on our way back to Bridgeport. 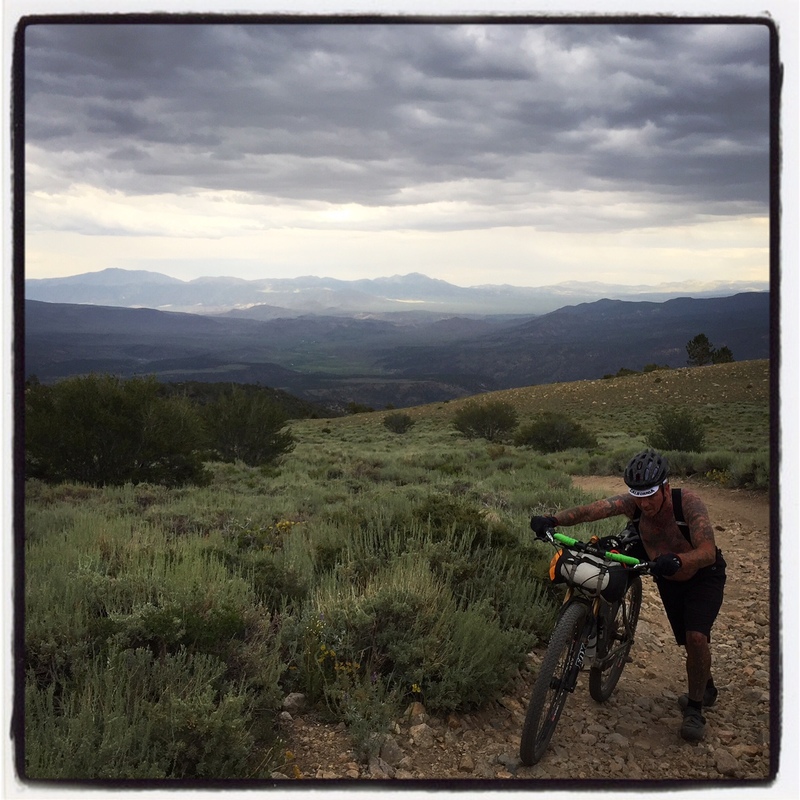 This entry was posted in Favorite Rides and tagged 29 plus, belfort, best, bikepacking, bridgeport, eastern sierra, epic, gnarvester, hugo, mammoth, midfat, mountain biking, patterson, ride, route, stans, sweetwater, walker. Bookmark the permalink.